Supercritical CO2 is a fluid state of carbon dioxide where it is held above its critical point (i.e., critical pressure and temperature). The density at that point is similar to that of a liquid and allows for the pumping power needed in a compressor to be significantly reduced, thus significantly increasing the thermal-to-electric energy conversion efficiency. 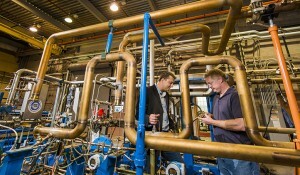 Sandia National Laboratories (SNL) is researching a thermal-to-electric power conversion technology in a configuration called the recompression closed Brayton cycle (RCBC) that uses supercritical carbon dioxide (s-CO2) as the working fluid, rather than steam, thereby dramatically increasing conversion efficiency compared to the steam Rankine cycle. The primary reason for improved power conversion efficiency is simply that the use of s-CO2 as the working fluid in a Brayton cycle requires less work to convert a given thermal input to electricity. In general, increased efficiency represents increased output for the same thermal input, regardless of the thermal source (natural gas, nuclear, solar or coal). Where fuel costs are a significant portion of overall costs (coal and natural gas fired plants), the benefit is reduced fuel costs. Where capital investments are high (nuclear and concentrating solar power), the benefit is increased output for the initial investment. s-CO2 power cycles are potentially applicable to a wide variety of power-generation applications. 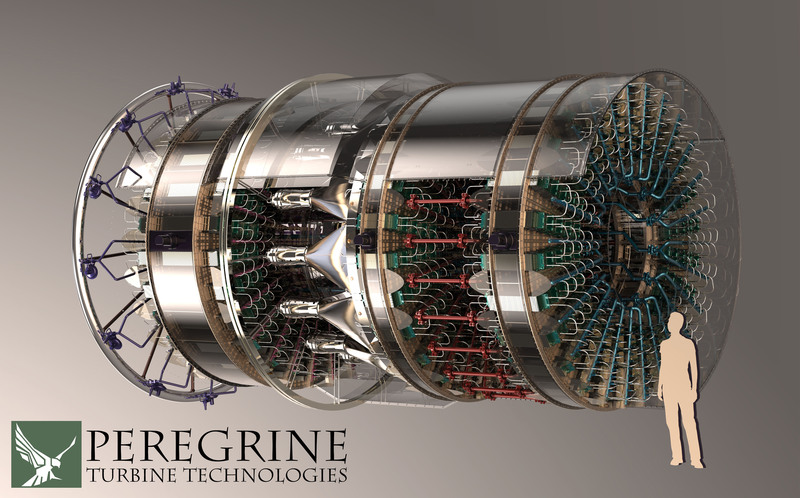 Nuclear power, concentrated solar thermal, fossil fuel boilers, geothermal, and shipboard propulsion systems have all been identified as favorable applications for s-CO2 cycles and would replace traditional steam Rankine cycles. Concentrating solar power (CSP) plants have two main goals (1) increasing the efficiency of converting solar thermal power to electricity and (2) reducing the amount of water needed for generation and cooling. 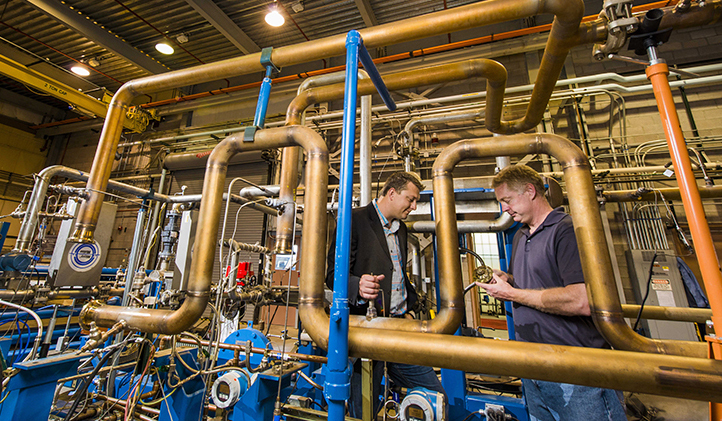 Sandia’s CSP team, supported by our Nuclear Energy Systems Laboratory (NESL), is investigating strategies for a dry-cooled, s-CO2 Brayton cycle to meet these goals but a major challenge is the transfer of heat from CSP (very high temperatures) to the Brayton power loop. In July 2015 a continuously recirculating falling-particle receiver was installed in the top of the tower at the National Solar Thermal Test Facility (NSTTF). The Sandia-developed falling-particle receiver drops sand-like ceramic particles through the NSTTF’s concentrated sunlight beam, capturing and storing the heated particles in an insulated tank. The technology can capture and store heat at high temperatures without breaking down, unlike conventional molten-salt systems. Higher temperatures mean more available energy and cheaper storage costs because less material is needed to transfer heat. be included in a combined-cycle gas turbine power plant, the combined efficiency can exceed 60%, with reduced total capital cost. s-CO2 power cycles can modified for the large distributed energy market. In fact, Sandia and eight other companies and research organizations are collaborating to advance a distributed power system that can produce cleaner, more efficient electricity. This collaboration was formalized in a memorandum of understanding (MOU ). 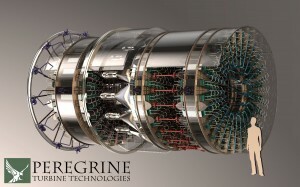 Organizations signing the memorandum with Sandia are Peregrine Turbine Technologies and its subsidiary PTT Distributed Energy Systems of Wiscasset, Maine; Vacuum Process Engineering of Sacramento, California; Mid-South Engineering of Hot Springs, Arkansas; and four partners from Huntsville, Alabama, CFD Research Corp., the U.S. Space & Rocket Center at NASA’s Marshall Space Flight Center, Government Energy Solutions Inc. and the Energy Huntsville Initiative.